This post originally featured in the Wells Journal on Thursday 5 December 2013. I’ve succeeded in not thinking too much about Christmas until the last week or so. I’m one of those who dislike getting Christmassy too early. I’m the one tutting when I hear a festive song on the radio before December’s even started. But there’s no denying we are now galloping apace towards the big day and it’s time to get organised. Thankfully, on the present-front I’ve not too much to do, having made big batches of pickles and chutneys back in the autumn, which will make lovely homemade gifts this year for friends and relatives. And we don’t have to think too hard about our children; they drew up their wish list months ago. On the food-side, it helps we all have such firmly rooted family traditions that the Christmas grocery shopping list practically writes itself. There are those things you simply must have or Christmas just wouldn’t be the same in your house. One of our essentials is the ham. I enjoy baking a large ham just ahead of Christmas to last us through the festive period. A simple meal of sliced of home-cured ham alongside the remnants of whatever bird we opted for that year, with delicious cheeses, pork pies, pickles and chutneys, is one of my favourite things about Christmas. How I prepare the ham is the part that varies each year. I have used Nigella Lawson’s ham in cola recipe in the past. It sounds revolting but I assure you it is delicious, and you really can’t judge it until you’ve tried it. 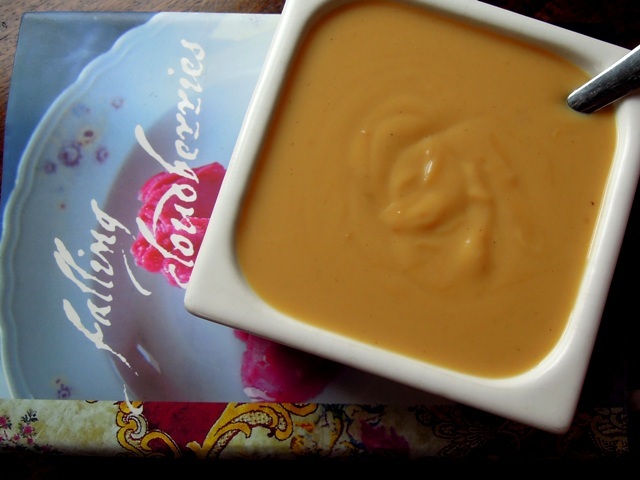 Another recipe I’ve tried and loved is this one from Falling Cloudberries by Tessa Kiros, who was born in London to a Finnish mother and a Greek-Cypriot father and spent her childhood in South Africa. Her cookbook is full of delightful recipes that bring together these various culinary influences. Baked ham with Finnish mustard would be eaten by her Scandinavian family on Christmas Eve, and it is ever so good. Mix together the mustard powder, sugar and salt together in a small saucepan until smooth. Put the pan over a low heat and add the cream, oil, vinegar and lemon juice. Bring to the boil, stirring continuously. Cook for about eight minutes and remove from the heat when the mustard has thickened and darkened. Leave to cool in the pan, stirring every now and then. Pour into sterilised jars and keep in fridge. As well as delicious as a glaze for ham, you can serve Finnish mustard with smoked salmon or sausages. Cover the gammon with cold water and soak overnight or according to your butcher’s instructions. Rinse the gammon and pat dry. Sprinkle with salt and pepper and wrap in foil. Place in a roasting tin and bake in the oven for 30 minutes, then turn down the oven to 180°C / gas mark 4 and bake for another three and a half hours, turning the joint occasionally. Remove the foil and leave to cool a little before glazing. Place the ham on a rack in a roasting dish. Mix together the breadcrumbs and brown sugar. 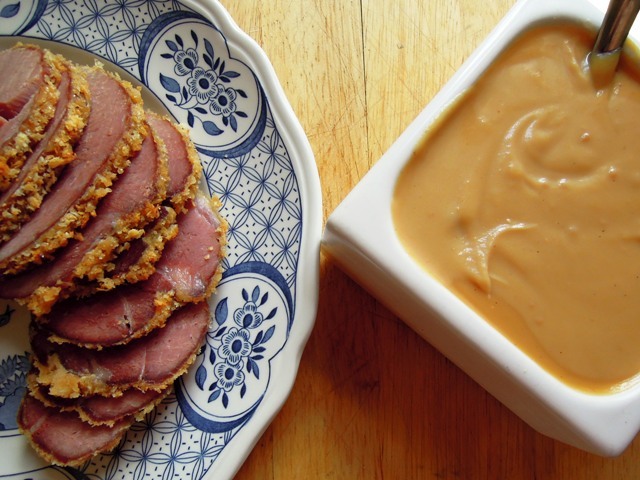 Spread the Finnish mustard all over the ham, using a knife or your fingers. 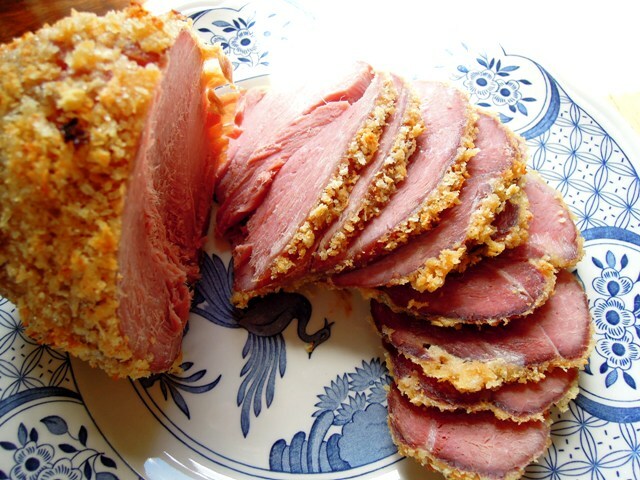 Sprinkle the breadcrumb and sugar mixture all over the ham, pushing it down to make it stick. Spike cloves in the top to form a rough diamond pattern. Bake for 45 minutes to an hour, until the top is golden and crusty, increasing the heat towards the end if necessary. Leave to cool before slicing. Serve with Finnish mustard and lingonberry jam (if you’re in Finland) or cranberry sauce. Your ham looks wonderful and I do love the idea of lingonberry jam with it. I have one ham left in the freezer from the Berkshire pigs we had in the garden last year and I really want to do it justice. Did you cure your own ham for this? I have a dilemma re adding saltpetre or not, knowing that the pinkish colour that adding saltpetre gives is appealing to most of the people eating it but I’m a bit uneasy about it – would love to hear how you cure yours. I don’t cure my own ham I’m afraid but I’ve consulted Falling Cloudberries, from which I got this recipe for Tessa Kiros’ advice on curing your own ham. She says: “Because I don’t use saltpetre for the preserving, my ham is not as pink as those you will buy. If you are going to cure your ham yourself, you should be extra careful with the brining process, especially if you don’t use a preserving agent. “I buy a leg of pork about 6-7kg and I mix 4 tbsp salt and 2 tbsp sugar and rub it over the cleaned and skinned pork, then leave it for a day in a cool place. Next I boil up a brine for a few minutes using 800g salt, 10 litres of water, 10 peppercorns and a few bay leaves.